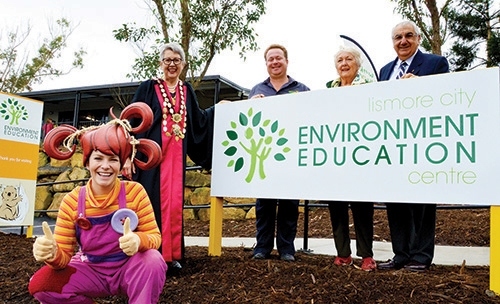 The Lismore City Environment Education Centre is located within the beautifully landscaped grounds of the Lismore Rainforest Botanic Gardens located at the Lismore Recycling & Recovery Centre in East Lismore. It is an excellent venue for training, workshops or meetings, and is a great asset for use by school and community groups visiting on one of our tours. The centre has state-of-the art-technology including an interactive whiteboard and projector, with an integrated audio system. The centre also has a kitchenette with tea and coffee making facilities, making it a convenient location for your next meeting or function. It is also just a very beautiful, tranquil setting among the gardens. The Lismore City Environment Education Centre is available for hire for staff training and meetings. Subsidised hire fees and free use is available for organisations and community groups affiliated with Council. For centre bookings or to organise a tour of the facilities, phone us on 1300 87 83 87.